Our company‘s aim is to make the business immigration to Lithuania much easier! If you are interested in doing business in Lithuania, we will assist you with your business establishment here by providing a full package of company registration services that would be even possible without your personal presence in the office. By choosing our services for your company registration in Lithuania, we will help you to save your valuable time and money. Many entrepreneurs are seeking to expand their field of activities and to enter new markets or to optimize taxes often by opening a business in the European Union countries. If you also want to start your business in one of the countries of EU it would be advisable to think about company registration in Lithuania. There are many reasons for choosing Lithuania as an attractive country for business registration. How to choose the right legal form of the company? To date, private limited company is the most popular form of legal entity. It is a legal entity with the limited liability, i.e. the company is responsible to the creditors only with the property of the company. The process of registration of the company does not take much time and does not require large authorized capital. The company is quite simple to operate (as it does not require presence of the board) and is flexible in making important decisions. Also, if you are looking to buy an already established company (like running business for sale), private limited company legal form is the most common form. The individual enterprise can be an alternative for conducting small business, but unlimited liability is a serious disadvantage. For the same reason (the existence of unlimited liability for some members), full and limited partnerships do not seem to be very attractive. Public limited company though has a limited liability, but is used mainly for larger companies as it requires substantial funds for formation of the authorized capital and a more complex management structure. Small company is a relatively new legal form of the companies in Lithuania. It is a legal entity with limited liability. Although the creation of such a company does not require the authorized capital, the founder of the company can only be individuals; bookkeeping is easier than in private limited company only in some cases. Make a founding act (the contract) as it is prescribed by law. Open a savings account in the bank for the authorized capital. Complete and sign the necessary forms for the registration of the company in the Register of Legal Entities. The documents must be certified by the notary in accordance to the established procedure and passed to the Register of Legal Entities. The founding documents are received and issued by the Register of Legal Entities only in the national language; so, the documents should be prepared in the Lithuanian language. However, if necessary, the documents may be translated into any other language. Moreover, the documents can be written initially in two languages. The founder can also arrange the documents himself; however, without adequate experience the process may be delayed. Therefore, if you decide to open a company in Lithuania it is advisable to turn to experienced professionals that will help to avoid possible problems and will finalize the whole procedure in a week’s time. You will only need to sign prepared documents and to present the necessary information for filling in various forms with the Register of Legal Entities. On the other hand, in order to avoid the procedure of registration of the new company you can contact us and buy a ready-made Lithuanian company with a minimum share capital and a bank account. In case of acquisition of a shelf company in Lithuania a contract of sale of shares is executed, then you can start using the ready-made company. The company is acquired with its founding documents. This method of starting business is faster, but it is little bit more expensive. However, if necessary, you may need to change the name of the company or to increase the share capital, or to perform other transformations. All these procedures are not difficult and can be carried out by our specialists in a relatively short time. It is for an entrepreneur to decide whether to open a new company or to buy a ready-made company in Lithuania. After registration or acquisition of a new company, you can begin to work and dispose of funds on the account of the company and enter into the transactions. Then, you should think about registering the company as a VAT payer, hiring of employees, preparation of employment contracts and other internal documents of the company. However, you can also entrust all these questions to professionals who will provide you with support after the opening of the company in Lithuania. Thus, the company can be opened quickly and inexpensively. If you take into account all the nuances of business in Lithuania, the company will open up new prospective and stimulate your further development. How does the registration process will look like? The Client sends us documents and the required information (copy of passport, your email, address, telephone number) by email info@bizbon.com (it will take several minutes) to prepare a contract. The client pays an advance payment of 50% of total amount to initiate the process (it will take 1-3 days until the payment will be cleared in our bank account) (up to 3 days). We prepare necessary documents for the Client to sign within a week or faster and send them by email (up to 7 days). Then the Client prints out our arranged and provided documents pursuant to the instruction, then signs name and signature where needed, and sends back to us by a fast post courier (it will take 7 working days until documents arrives). After we receive the documents, it takes about a week to arrange a full package of documents to the Client (up to 7 days) of company registration in Lithuania. Further, when the documents are created and ready, we scan company registration in Lithuania certificate and send to the Client by email address. Follow that the Client have to pay remaining payment of 50% of total amount. In the next stem client pays the rest of sum. It could take up to 3 days to get money, that depends on sender and receiver bank. Finally, we do send out all arranged documents to the Client by express courier. Normally it takes up to 3 working days. We are always more than happy whenever we can assist a newcomer to Lithuania. We really know how hard it is to enter a new market and that you need only the best support and most professional and honest consultants at the beginning. By starting a company registration procedure there are always many external factors that you need to be aware about. Average salary rates, different taxation for each individual business type, recruitment possibilities, office selection and many more things has to be taken into consideration while setting up a company in Lithuania. If you want to setup things in a right way at the very first time, then you should look no further and contact us asking for assistance or at least a good advice! Registration of representative office of a foreign company gives to the entrepreneur a very limited ability to do business, because the representative office may not engage in commercial activities, but rather performs some other functions. However, in certain cases, registration of a representative office is justified for tax reasons. In contrast to the representative office, the branch may conduct business but it is not a separate legal entity. However, before you register the branch you should consider the nuances of taxation carefully. Therefore, before you open a company in Lithuania, you must weigh all of the above mentioned aspects. For all the above reasons, foreign businessmen often open a private limited company. One of the most important steps in the process of registration of a company is the choice of areas of activity of the company. A license may be required for conducting of certain activities in Lithuania. Therefore, this issue should be worked out in advance. You also need to decide who will be the founders of the company. In order to open a private limited company, it is enough to have one natural or legal person, but anyway not more than 250 shareholders. The authorized capital of the private limited company is 2 500 euros. This amount will be available for operation immediately after the registration of the company documents. It should be noted that the director of the company could only be a natural person. Thus, foreign nationals may be directors and shareholders with no restrictions. Branch office – not a legal entity. The process of company registration in Lithuania consists of several stages. When choosing a legal form for your company, you should pay attention to the objectives pursued by the entrepreneur who is starting a business. If you still have some question on how to choose the best company according to your needs or you are doubting and looking for some good advice from the professionals, you are always welcome to contact us online as well. Also, we can give you some good advice on the regions and cities in Lithuania where you can start and develop your business. Vilnius as the capital is the most attractive for the foreign people but our country has also some other big cities full of investments and favorable business environment – like Kaunas (the second largest city in Lithuania) or Klaipėda (the third largest city in Lithuania on the Baltic sea coast with a higly developed seaport). No additional cost for starting a business in other city than the capital (Vilnius) is included. Registration process of your business would be also very similar in all the cities in Lithuania. As our company‘s goals are highly oriented to our clients needs we want to do our best to make the business immigration to Lithuania much easier. Therefore, we want to share our knowledge with you and give you some good advice on how to choose the optimal legal form of your company. As you are already familiar with all the possible legal forms of doing business in Lithuania, below there are provided some more detailed information about the them. IE Unlimited civil liability 1 sole owner Undetermined. There is no minimum set. IE owner is also a director of the company, although, other person can also be appointed for this position. European Union membership and geographic location. First, it is useful to have an operating company in Lithuania because the country belogns to EU. Due to convenient geographical location of Lithuania, it is easy to get to anywhere in Europe. Also it enables the country to be active both from the north to the south and from the west to the east directions. Moreover, being a member of EU, country has open borders with all the EU countries and common currency – Euro. It means that by having business in Lithuania you will be able to deliver your products ad services faster – without long procedures of filling all the necessary documents. Convenience in registering a new company. Second, it is convenient to have a business in Lithuania. Registration or acquisition of the company is very fast and the process is simple because it does not require much money and time. In addition, you will probably not face any language barrier since many people are fluent in English, Russian and often in Polish. Increasing competitiveness of your business. Third, by opening a new company in Lithuania or buying an existing one, you can achieve a new level of development and become a part of a new larger market. Having a European company will help you to attract new customers and markets, to expand the horizons of your business activity. A beneficial tax environment. Fourth, Lithuania has almost the lowest taxes in the whole European Union. 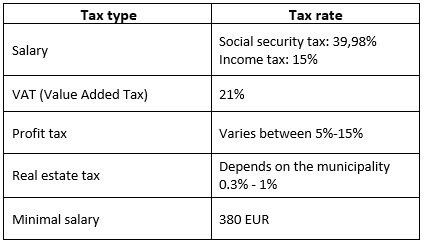 Therefore, it is advantageous to do business in Lithuania for tax reasons: tax on corporate profits – 5% or 15% and VAT (value added tax) – 21%. New technologies environment. Fifth, in Lithuania there are used many new technologies in order to greatly simplify the entrepreneurs‘ activity. Most government services are available online. Thus, an accountant or another employee may submit all the reports, declarations, applications and other documents electronically. In addition, the country is proud of the fastest public wireless Internet (Wi-Fi) in the world and very high speed of broadband connection. You can easily make international transfers in foreign currency through online banking. In addition, Lithuania belongs to the Single Euro Payments Area, known as SEPA. This is an EU initiative encompassing 34 countries in total that ensures the payments in euro to be executed under harmonised terms – it means that the same payment form and conditions are used for domestic payments (inside Lithuania) and international payments. In order to do the payments generally, you only need connection to the bank and a PIN generator for the code idenfitication. Favorable economic environment. Moreover, Lithuania ranks 15th place of the most free economies in the world, 11th – on the ease of starting a business, also in the 2nd place in Europe in terms of index of investment attractiveness. 1.5 million of professionals make labour market in Lithuania. It should also be noted that Lithuania ranks first among the countries of Eastern and Central Europe in the number of graduates in mathematics, science and technology per capita and third among the countries of Central and Eastern Europe for the quality of education in mathematics and natural sciences. Programming and information technology, biochemistry, pharmaceuticals, physics, medicine are well developed here. Financial sector is developing fast. In recent years, such world famous companies as Western Union, Barclays, NASDAQ have opened their offices in Lithuania. Thermo Fisher Scientific, Swedish giant IKEA, one of the leading European retailer Lidl are operating successfully here. Therefore, by opening a company in Lithuania means starting a business at a new level corresponding to the highest standards of business conduct. Based on the above facts, the decision to do business in Lithuania looks very favourable. So, if you have already decided to register a company and start a business in Lithuania, below there are provided some steps and valuable information on what you need to know before the company formation in Lithuania. Lithuania business immigration process requires legal form of company to be chosen first. So, you should think about the optimal legal form of the future company. Below there is a list of possible forms of registered companies.